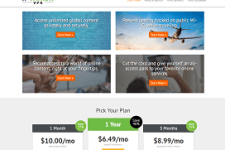 Noodle VPN Review – Is the Service Worth Your Time And Money? Noodle VPN is an established VPN provider having more than 3 years of experience in the online security industry. Established in 2009, the service is brought to you by a United States based company. In this exhaustive Noodle VPN Review, we will examine the features provided by the service and decide if is worth our time and money. Noodle VPN has servers in 8 different countries – United States (Los Angeles, Texas, Chicago), United Kingdom (London), Netherlands, Switzerland, Australia, Singapore, Sweden and Canada. The service provides an excellent way to bypass the firewalls and censorship imposed by organizations and countries such as Kuwait, China, Saudi Arabia, Qatar and UAE and unblock your favorite sites like Facebook, Twitter, Gmail, YouTube, Google Voice and Skype from anywhere. In addition, the service would allow you to unlock your favorite GEO-IP restricted services like Netflix, Pandora, ABC Player, BBC iPlayer, iTV Player, ABC iView, Demand 5, 4OD, Amazon Prime videos, Zattoo, Spotify, Rara, Wilmaa, CBS, NBC, Mio TV, CBC, CTV, E!, Eurosport, MLB, NFL, Fox, Sky and HBO On Demand irrespective of your current location. Since the company offers country based VPN service, it is not possible to switch severs and unlock local content from more than one country with one subscription. Noodle VPN delivers high speeds and bandwidth through 100 MBPS dedicated ports. The speed and bandwidth on offer is well suited for activities like downloading, VOIP, streaming, gaming and torrenting. The company allows P2P/torrent traffic only through Switzerland servers so you need to subscribe to its Swiss VPN service if you want to anonymize your torrenting activities. The company guarantees 99% uptime so you can expect to get an uninterrupted service for long durations. Noodle VPN delivers anonymity and privacy through PPTP, L2TP/IPSec and SSTP protocols. The wide choice of protocols ensures an optimum mix of security and compatibility. The service creates a secure tunnel to protect common online activities like browsing, FTP, VOIP, ICQ and emailing and at the same time it secures your banking transactions, passwords and social accounts when you are using low security wireless networks at airports, malls, hotels and book shops. The company respects the privacy of its customers and it will not hand over customer data to anyone unless forced to do so by the law enforcement agencies. Noodle VPN works with Mac , Android , Linux , Windows, iPads and iPhones. 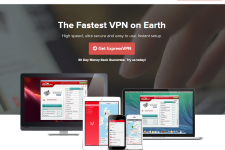 Unlike many other VPN providers, the company offers a dedicated IP VPN service so you will not get a new IP address every time you connect to the service. Although the company does not offer a custom VPN client, the setup is simple and easy and even people with low technical knowledge can start using the service within minutes. The company does not block any port on its servers but sending mass emails through port 25 is strictly prohibited. The company provides customer support through live chat and email. The company has also published basic troubleshooting information on its knowledgebase portal which should help those who like to fix things on their own. Noodle VPN’s subscription price is different for access to different servers. The US based plans (access to one US server) are available from $18 per month ($31 for 3 months, $66 for 6 months and $110 for one year). The price for other server locations varies from $12 per month for access to Dutch server to $24 per month for access to Australian server. The service is definitely more expensive than other VPN services but you have to keep in mind that providing a dedicated IP VPN service requires additional infrastructure investment which in turn increases the subscription price. The company does not offer a free trial and refunds are available only if a customer is unable to use the service for 3 days (and claims a refund within 4 days of joining). 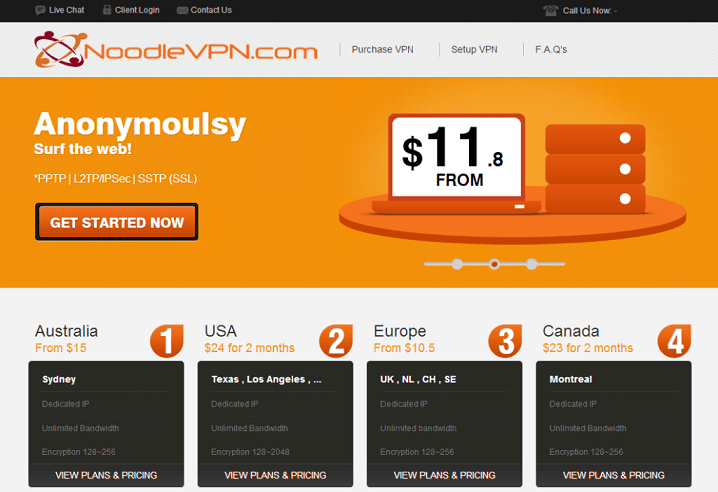 Noodle VPN strives to provide a fast and secure VPN service through its network. Since the service is expensive and doesn’t provide server switching options, it is not meant for budget conscious users who need access to servers from multiple countries at a low price. However, you check it out if you are looking for a dedicated IP VPN service and don’t mind paying extra for such a solution. For more information, please visit: www.noodlevpn.com. SurfoNym VPN Review – Should You Subscribe?